Red Dingo dog collars are manufactured in premium nylon webbing for strength, durability and ease of care, with solid stainless steel D-rings, and their trademarked ‘Buckle-Bone’ side-release buckle. Tough, functional, and built to an exceptionally high standard, you and your dog are bound to love them! 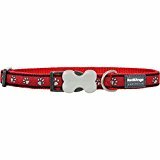 These versions of the Red Dingo Dog Collar are available in a variety of attractive patterned designs, so your dog won’t only have a collar that lasts; it’ll look the business too. Red Dingo originates in Australia, and these designs have a truly authentic Australian street and surf style. This entry was posted in Dogs and tagged 15mm, 2436cm, Collar, Designer, Dingo, Prints by One Boutique. Bookmark the permalink.